While I was perusing the IRRC Family Resources Collection over winter break, I came across a great activity called “Putting Your Family Calendar to Work.” This resource provides several different ways that children can use their family calendar to work on math and reading skills. I thought this resource would be a fun way for my children to develop vocabulary and strengthen their understanding of calendars. Time is such a difficult concept to teach young children. When my children ask how much time something will take and I say, “1 hour,” I am not sure they really understand what that means. Trying to talk to them about something that happened one year ago, one month ago, or even one day ago can sometimes be confusing to them. Recently, however, I have noticed that Griffin seems to be a little more aware of time and what it means as far as planning. Likewise, Ryan’s kindergarten class is learning the days of the week and the months of the year. 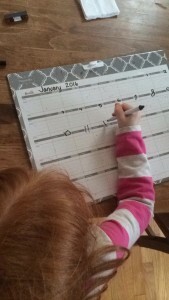 I thought “Putting Your Family Calendar to Work” looked like the perfect resource to use with my children. “Putting Your Family Calendar to Work” suggests that families have children get involved in writing birthday reminders on a calendar. I thought we would take it a step further and have my children fill out our calendar for the month. For starters, they love helping out (I wish this would last, but I know it probably won’t) so they were excited when I asked them to help me fill out our family calendar as part of their chores. We recited this poem a few times and then I asked Griffin to fill in some of our important dates and activities on the calendar. After he filled in his afterschool activities and his Nana’s visit, we had a great discussion. We talked about what we would do when Nana visited and all the foods he would ask her to make. We talked about how Griffin was excited about the two soccer games he had coming up and that they were two weeks apart. The best part was that the children filling out the calendar prompted us to have a great discussion about our upcoming month. Another way this resource connects math and vocabulary is by having families identify new words that relate to the month’s activities. We talked about the weather and they talked about how gray the sky had been for days. I asked them if “gloomy” would be a word to describe it and they agreed. So, “gloomy” became our first word. We also decided upon “freezing” and “grandmother.” We wrote our three words on index cards and taped them on the fridge beside the calendar. I will try to work those words in our conversations throughout the month. “Putting Your Family Calendar to Work” offers other great ways for families to use the calendar to connect reading and math. Once again, it was an easy way for our family to make learning fun. I suggest you search “calendar” in the IRRC Family Resources Collection to access this great resource.